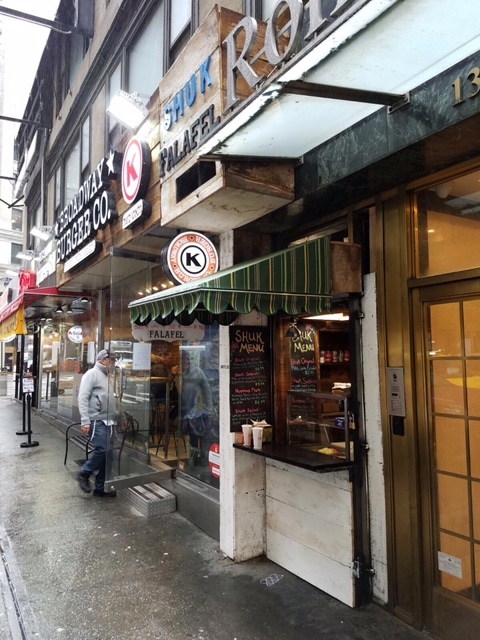 The owners of the recently opened kosher falafel stand in NYC, Shuk Falafel, were asked by the building’s landlord to move the Shuk Falafel stand, forcing it to close, albeit temporarily. According to the ownership of the multiple kosher restaurants in that space (which include Broadway Burger Co. next door, and Sakura of Japan), Shuk Falafel will be closed temporarily as they make plans to reopen in another part of the building, potentially downstairs with a takeout counter. Shuk Falafel’s limited menu offers falafel and sabich sandwiches and platters. Keep an eye on this post for new about its reopening. Shuk Falafel and the other restaurants in this space are under the kosher supervision of the OK.